WASHINGTON (CNN) -- President Obama told congressional leaders Thursday he's planning to pull all combat troops out of Iraq by August 2010, according to three congressional officials. President Obama says he plans to keep up to 50,000 support troops in Iraq after combat troops leave in 2010. Under this scenario, all combat troops will be withdrawn within 19 months of Obama's January inauguration, three months longer than his promise on the campaign trail. In a meeting at the White House Thursday evening, Obama also told lawmakers that he plans to keep a range of 35,000 to 50,000 support troops on the ground in Iraq after combat troops are out, the officials said. 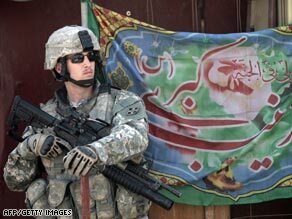 All U.S. troops have to be out of Iraq by December 31, 2011, under an agreement the Bush administration signed with the Iraqi government last year. White House officials confirmed the president will deliver a speech about Iraq to troops at Camp Lejeune in North Carolina on Friday, his first visit to a military base since being sworn into office. The officials refused to comment on the details of Obama's plan. While liberals may be frustrated that Obama is not keeping his campaign promise to the letter, the president could win credit from lawmakers in both parties for giving military commanders more time and flexibility to finish the mission. What may turn out to be more controversial is the number of noncombat troops that will remain in Iraq under Obama's plan. Military officials have stressed that residual, noncombat forces would focus on supplies and logistics to protect U.S. interests in the region. But senior Democrats such as Senate Majority Leader Harry Reid have expressed concern over such a large number of troops staying in Iraq after combat forces have left. One source familiar with the discussion told CNN that Democratic lawmakers complained in private to the president about the remaining troops just as they have in public. "That's a little higher number than I expected," Reid said Thursday before the White House meeting. Sen. Richard Durbin, the No. 2 Democrat and a close Obama ally, said before the White House meeting that he's anxious to get troops home. But he defended the administration, saying it is "trying to strike the right balance" between ending the war and maintaining stability in Iraq. A spokeswoman for Sen. John McCain, the top Republican on the Senate Arms Services committee and an attendee at the White House meeting, told CNN that McCain supports the plan to leave 50,000 troops in Iraq. Rep. John McHugh, the top Republican on the House Armed Services Committee, said after the White House meeting that Obama assured him the plan to withdraw all combat forces will be revisited if conditions on the ground in Iraq deteriorate. "The president's objective to withdraw U.S. combat troops from Iraq is one we should pray for, plan for, and work toward," McHugh said in a written statement. "However, I remain concerned that the security situation in Iraq is fragile, and we should work to mitigate any risks to our troops and their mission. I specifically raised these points with the president this evening, and he assured me that he will revisit his plan if the situation on the ground deteriorates and violence increases," he said. "Our commanders must have the flexibility they need in order to respond to these challenges, and President Obama assured me that there is a 'Plan B,'" McHugh said.